Page Two Books, Inc., 9781989025260, 140pp. Can you win life's battles without losing yourself? Life is full of trials, and sometimes you need a warrior spirit to overcome them. Award-winning attorney Heather Hansen has spent over twenty years fighting on the battlefields of the courts--but even in her fiercest clashes, she's remained true to herself and her principles. She shares her journey to becoming an Elegant Warrior, and imparts the wisdom she's learned from her decades on the bar. 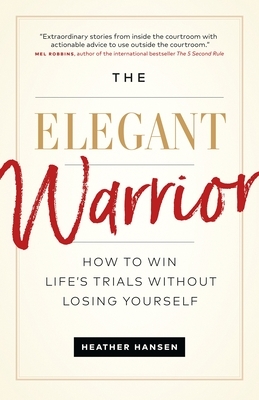 Armed with the tools and techniques she's honed in the courtroom, Hansen makes the case that anyone can become an Elegant Warrior: someone who fights adversity with grace and compassion, and battles without losing respect for themselves and their adversaries. Using real-life case studies and personal stories from the fast-paced courtroom arena, Hansen teaches you how to triumph over your own struggles. From overcoming the Curse of Knowledge to discovering the Power of How, you'll learn how to tap into your own personal strengths to face whatever challenges come your way. We all have to go to war at times. Sometimes the combat zone is your home; sometimes it's the office. And sometimes, it's your inner world. As an Elegant Warrior, you'll be armed with the confidence, wisdom and skills to enter the fray and remain true to yourself. Heather Hansen is obsessed with communication. Through her work as a communications consultant, speaker, host and attorney, Heather has appeared on CNN, Fox News Channel, CBS, and Sirius Radio. She is also an on-air host at Law and Order and has leveraged her credibility and trust to try cases to juries for over 20 years. Heather has been consistently named one of the Top 50 Female Lawyers in Pennsylvania. Heather's psychology degree allows her to communicate as a counselor, helping her clients achieve peace of mind in the most stressful situations. She's also a mediator, working with individuals to resolve disputes and find common ground. Heather is the co-founder of The Enlightenment Series, where women share stories and build connections through communication. She's contributed to Global Grind, Thrive Global, and KevinMD and has spoken internationally on the importance of communication and the key for every participant to Win With Words(TM).